Traditional Marriage includes… | Are Women Human? ← Gender confusion as “reparative” therapy, cont. From Blackened Butterfly via New Wave Feminism. The gay marraige thing will come soon. So will group marriage I think. That one may be 5o years away though… but it will also come. Yea, credit is just a *little* bit important. 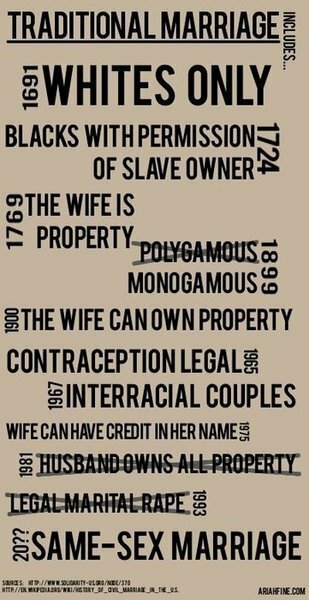 I have a friend whose mom was involved in changing the laws in California so that women could have lines of credit without a man’s permission (this was the model for the national law). She was putting her husband through grad school but couldn’t buy furniture on her own! Ridiculous. I agree with you re: marriage equality. Harder to see poly marriages becoming legally recognized anytime soon, but who knows? There’s a lot of serious discussion of nonmonogamy these days. And that they will ship it to me by Thursday. It is going up right above my computer screen at work. Outstanding stuff. I do not know anything about the site I bought it from, so if there is a way to buy directly from the artist that someone knows of, please pass that along. I am ever again glad I added you to my blogroll! This is an awesome graphic. May I post it in my blog …with credit back to here and to the tumblr feed? wow. thank you so much for sharing this eye opening piece. i’m proud to be a New Yorker this week now that the Marriage Equality legislation has passed! woo hoo! Thanks for the comment and welcome to the blog, Franchesca! Hey all, this is Ariah, the designer of the above poster. So glad you guys like it! Encouraging to see all the reposts and everything. That link to imagekind is something I set up for folks who wanted to buy prints. I’ve been meaning to revamp it again and should get around to it. If you have any feedback on what you’d like to see it available as (t-shirt, coffee mug), let me know and I’ll try and make sure those options are there. Hi Ariah, thanks for the comment! It’s a great image :) I’d love to see it on a postcard or a coffee mug. Banner art created by Saetia. Reminder: AWH has moved! Update your links and feeds. Top AWH posts of 2011 + exciting news! Are Women Human? Tumblr: micro blogs on gender, race, and sexuality, plus lighter, more pop-culture oriented posts. Grace on AWH is moving! prosey on AWH is moving!